In a current day and age where it is commonplace to be “plugged in” at all hours of the day, stress levels are on the rise – and taking a toll on our skin. 75 percent of adults are reporting moderate to high levels of stress, and according to Cynthia Ackrill, MD and Fellow of The American Institute of Stress, stress is also responsible for up to 70-90 percent of doctors visits. We have always blamed stress for flare ups in our skin, but the vast majority of us haven’t realized how much our stress was actually taking a toll on our overall physical appearance – until now. 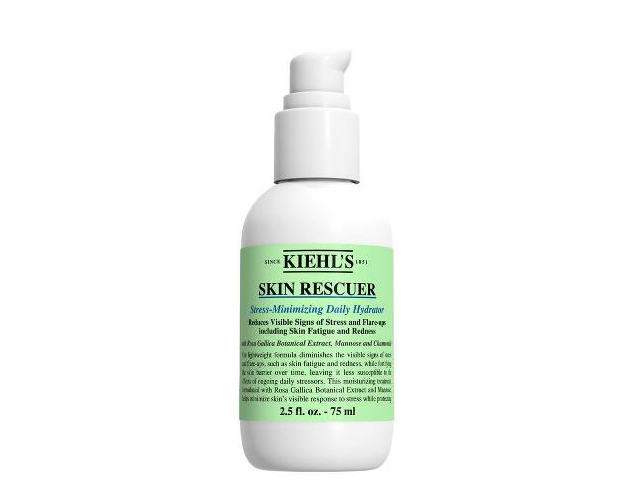 Kiehl’s has recently launched a new product (the first in what will be a line of stress-related products) called Skin Rescuer, to help with any stress-related ailments. In their studies, they’ve found that skin is actually the first of the body’s organs that stress begins to appear, showing up with signs of redness, fatigue, dehydration, blotchiness and overall visible signs of aging. Once we heard that news, we knew we had to act – and now. It addresses both short-term and long term signs of aging (and stress results) on the skin, helping to improve the overall skin quality, dryness and blotchiness. While many products may target one problem area, with Skin Rescuer you’ll find your overall skin health improve in just a few short weeks. Formulated like a moisturizer, the product is easy to use and creamy enough to replace your daily moisturizer – just don’t forget the SPF! The clinical results from testing showed a 100 percent improvement in overall skin quality, when applied in the morning and at night, which means it’s as simple to use as your daily moisturizer. With a product that shows these kind of results with little effort, we’re definitely on board!